What is the lifestyle in Coogee Accommodation Sydney? The Coogee View with its perfect sunny northerly aspect, overlooking Sydney's Coogee beach, offers the perfect beachside holiday accommodation in Sydney. Directly across the road from The Coogee View Beachfront Serviced Apartments, in the park overlooking the beach, are large covered picnic areas with BBQ facilities. Also in the park across the road from our serviced apartments are huge children's play areas and ovals along the beach. Our uniquely spacious serviced apartments in Sydney are frequented by families who like to relax and unwind in their home away from home. One of the many amazing restaurants on the beachside in Coogee is the famous Barzura, full of patrons rain, hail or shine and just metres from your front door. Even on a winter's day, families, travellers and those just looking to relax by the beachside, flock to Coogee Beach. Ceviche, directly underneath our serviced apartments, for your convenience, offers appetising breakfasts, lunches and dinners. Coogee Boutique, conveniently located just downstairs, offers the ultimate indulgence with an extensive range of hair and beauty services. Enjoy both the sea and surf, or a rock pool beneath The Coogee View Beachfront Serviced Apartments, which is ideal or both the lap swimmer and for children of all ages. Crystal clear waters of the rock pool, a perfect addition to our holiday accommodation and a safe and fun place for children to play. The perfect holiday accommodation in Sydney, The Coogee View is frequented throughout all months of the year by families and travellers alike. 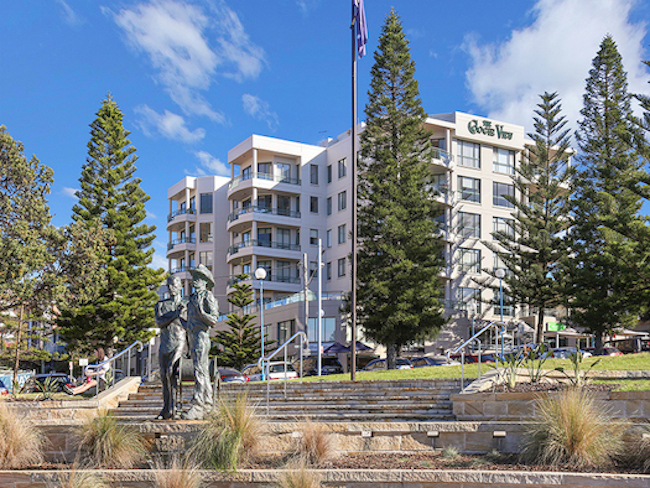 We also offer serviced apartments in Coogee down the road from our main building, on the beach at Brook Street and Dolphin Street, right next to Coogee Palace. Whilst staying in our serviced apartments, explore all the other glorious rock pools surrounding Coogee beach. Visit the site of the Coogee Virgin Mary where in 2002 thousands of people congregated on the beach to "catch a glimpse of what is being described as an apparition of the Virgin Maryi". Starting just a stroll away from our serviced apartments, the coastal walk from Coogee to Bondi has many scenic attractions and offers beautiful coastline vistas, cosy beaches and caf stops. The coastal walk from Coogee to Bondi. The Coogee to Bondi walk is 6km long. You may come across migrating whales, see the Sydney to Hobart yacht race. On your walk you make even take in sculptures by the sea. Ideal for the more serious lap swimmer, or anyone who might appreciate swimming in the famous art deco pools, are Wiley's baths, just a short work from our serviced apartments at The Coogee View. The Coogee View just minutes from Royal Randwick Racecourse, Sydney Football Stadium and Sydney Cricket Ground, Sydney CBD, Centennial Park, Sydney Opera House and Harbour Bridge and Bondi Junction. Sydney Football Stadium and Sydney Cricket Ground home to some of Sydney's biggest sporting events and are just minutes away from The Coogee View. Sydney's famous Bonnie Doon Gold Club, NSW Golf Club and The Lakes Golf Club are just a short distance from The Coogee View. Minutes from Royal Randwick Racecourse, Coogee is traditionally the accommodation area of choice for the horse racing fraternity. Just a short distance away is Fox Studios Entertainment Quarter. Catch a move, a live comedy act, go bowling or even catch Cirque du Soleil under the Big Top Tent. One of Sydney's finest beaches at your doorstep. The Coogee View Beachfront Serviced Apartments comprise spacious one, two and three bedroom apartments in the most prime beachside location in Sydney.